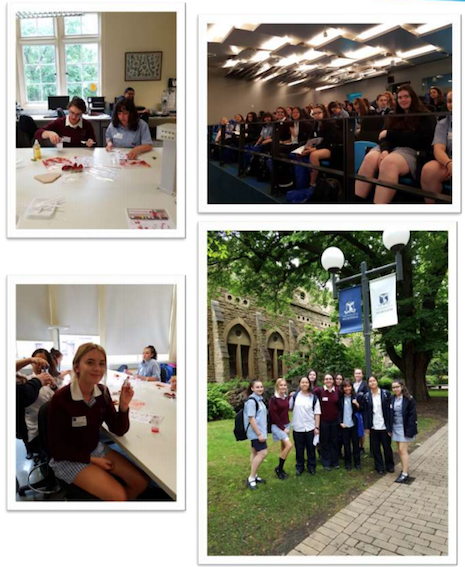 On Wednesday 14 November, Ms Mena took Te Ana C, Bianca G, Haifa H, Georgia M, Alana N, Alanah O, Cristina S, Shantel S, Jesse T and Wenwen Y to the Loreal Girls in Science Forum at Melbourne University. The day started off a little drizzly weather wise and they had a lovely tour of the Uni on their way to finding the correct building; it was lucky the grounds are so beautiful that the girls didn’t mind taking the scenic route! The afternoon was spent doing two workshops, the first was extracting DNA from strawberries, which our students excelled at, much to the pleasure and amazement of the scientists running the experiment. The second was the geology themed augmented reality workshop where they had a (sometimes nausea inducing) experience of using the virtual reality goggles and mining for gold, delving into the eye of a storm, and even exploring Mt Vesuvius. The main message from the day was that making the choice to study science at university opens the doors to a plethora of choices and possible careers as it is such an exciting and diverse area. Our students were fascinated by the myriad options and by hearing firsthand accounts of women who not too long ago where themselves choosing subjects in high school and were unsure of their future pathways, to find that due to studying science have forged careers that are challenging, exciting, life changing and never boring! It was clear from the participation and the questions that our girls were asking that they are an extraordinarily curious and capable group of girls who love learning and have made and will continue to make our school very proud.